The HKKMS is delighted to welcome back to HK Dr. Harpal (Pal) Bhusate. Pal last spoke to the Society in April 2013. 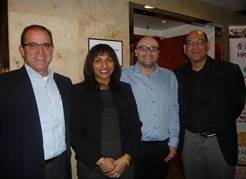 Below she is pictured with the then KM executives from the MTR. The meeting will be held between 6.00pm and 7.30pm at our usual venue on the 22nd Floor, United Centre, Admiralty . Pal was director of Collaboration for Vodafone and she will update us with recent case studies in promoting collaboration in the public sector in the UK. We aim to make this event more intimate and a more collaborative learning experience for everyone attending, therefore following Dr Bhusate’s introduction, we will facilitate a Knowledge Café with participants around the following key barriers to Collaboration and Knowledge sharing.